Castelnaud has a pleasant square which was still pleasant even though filled with a group of French children – they were very small and very well behaved. The main attraction was a boulanger substitute (called a dépôt de pain) from which I bought a baguette, and a boucherie which provided some pâté de campagne à la maison (home made) to go with it. 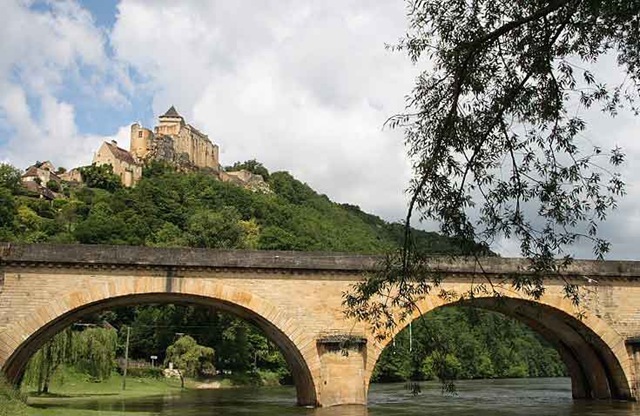 With lunch sorted, we cycled back along the Dordogne, looking very French with a baguette swinging from my handlebars, to Cénac before puffing and panting once more up the hill back to our campsite. Our timing was perfect; we had been back a mere five minutes when it started raining so lunch was yet again an internal affair. Afterwards, we went into Sarlat-la-Canéda for good ol’ McDonalds, some provisions to tide us over the coming weekend, and a newspaper. McWiFi was much easier to use inside than in the car park and Carol got an ice cream into the bargain while I supped an acceptable-though-not-scintillating espresso. Returning with our booty and newspaper, it was decision time: we’d been here almost a week, put up with three days stuck inside the van followed by three days of acceptable but not good weather and were wondering what to do next. The weather maps in Aujourd’hui showed continuing unsettled weather in the south, indeed, over most of France, but things looked better over on the west coast for the coming four to five days. So, we eventually kicked ourselves into the counter-intuitive decision to go west and slightly north tomorrow. It’s very difficult to break the instinct to travel south. 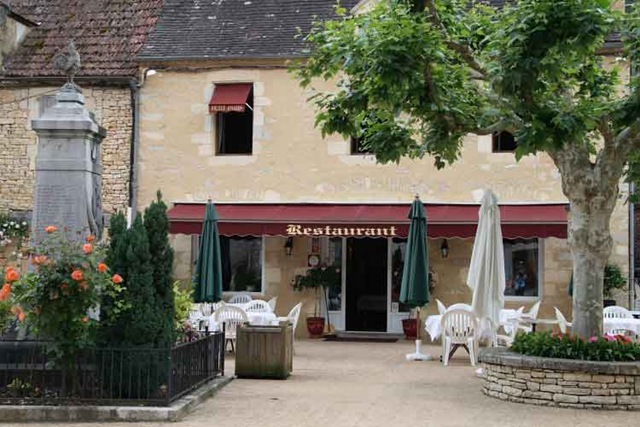 This might also give us the chance to meet friends and former colleagues, Mike and Linda Eaton, who have a house in the Marais de Poitevin at Arçais. They are apparently about to arrive for a week or so. The marais, a canal-drained marsh area inland from La Rochelle, is one of our favourite stops. Fingers crossed for the move. It certainly looks more French than the Edinburgh one. Keep up the good work & here’s wishing you sunshine.